Life is Short. Live it on a Deck. Gleaming in polar majesty, Glacier TruOrganics® Composite Decking recalls an open, empty tundra, hushed by snow and Arctic serenity. 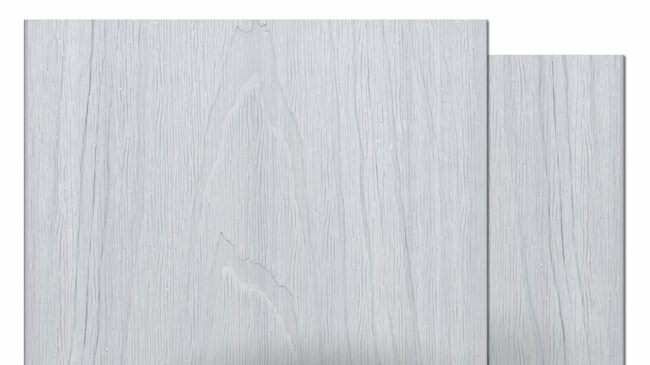 Cool frost-gray planks provide the perfect escape for stillness, reflection, and a return to wonder. This gray deck is made of 60% reclaimed wood fiber and 40% recycled plastic for the ultimate in eco-friendly durability. Regardless of everything else going on indoors, that refuge will always be there -- waiting, welcoming, and ready to renew your calm as you drift into your #DeckLife. Rich color options and authentic hardwood texturing without the splinters. Next generation composition and a 3G core ensure higher tensile strength & resiliency. A full protective wrap shield guards against stains, scratches, snow, and sun damage. Backed by a 25 year residential warranty. If you can think it, you can build it! 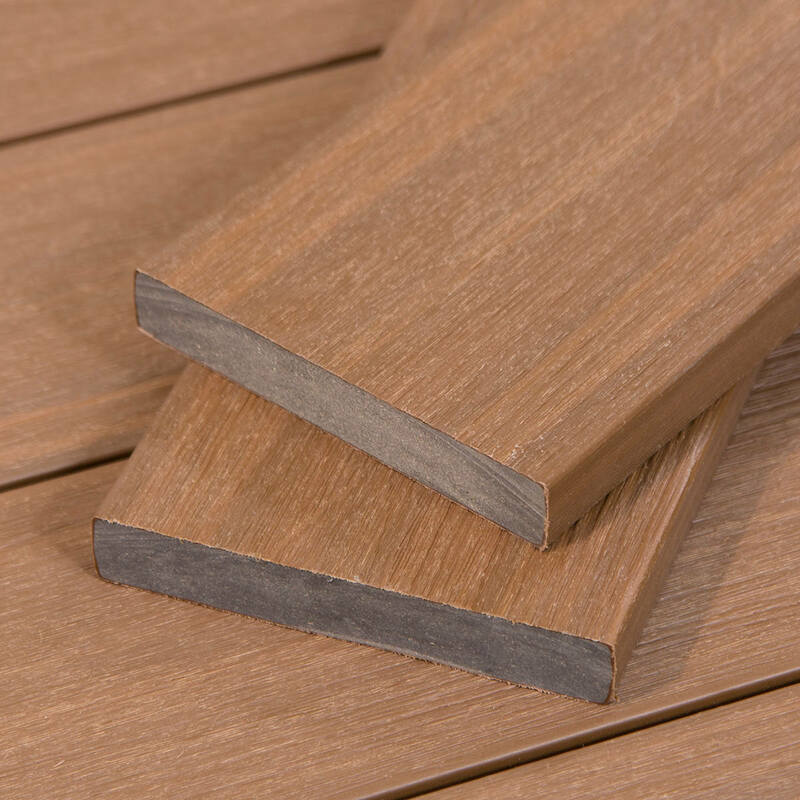 We offer fascia boards and square edge planks to help you put the final touches on your own custom decking project. All accessories are available upon request, designed to match your deck color. Building your deck is half the fun! We rounded up everything you need to know to make your project a success. Have additional questions? Give us a shout! Before you begin installation, remember to take your T.I.M.E. with this Cali Bamboo approved pre-install guide. 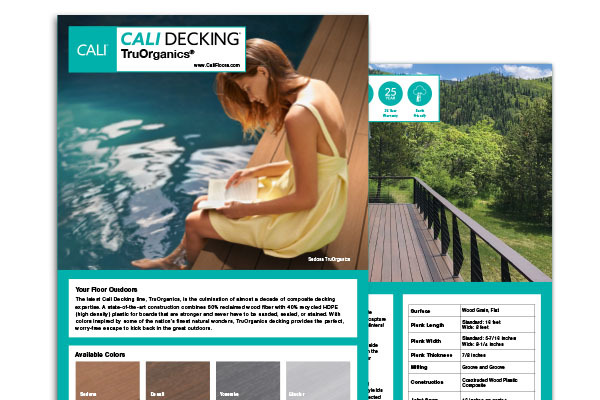 Install TruOrganics® composite decking with confidence by following the official Cali Bamboo Installation Guide. Download our bamboo decking Care & Maintenance Guide to learn how to keep your deck looking great for decades. Download all the materials you need to install your deck like a pro. Get to know your deck down to every last detail. 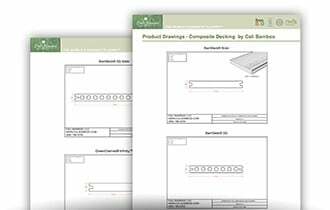 View detailed outlines of your deck for precise planning. Whether you're building it yourself or hiring a contractor, these Deck Designs are a great place to start. Q. What is TruOrganics® Composite made of? A. TruOrganics® comes from a proprietary formulation of 60% reclaimed wood fibers and 40% recycled HDPE plastics such as detergent bottles and milk cartons. Each plank is further protected by a four-sided ProFormance™ wrap shield. This ultra-durable composition combined with natural wood colors and grain yields a composite deck that boasts both beauty and strength. A. High Density Polyethylene (HDPE) has an extra high strength-to-density ratio and is one of the most commonly used plastics — typically found in more rigid products like milk gallons, cups and water bottles. Its strength acts as a barrier against moisture, and resists insects, rot and other chemicals. Easily recyclable and free from harmful emissions, the use of HDPE results in decking boards that are stronger, ultra-durable and more sustainable than composites with non-HDPE plastics. Q. How do I clean and maintain my Deck? A. Cali Bamboo decking is designed to withstand the daily wear and tear of outdoor living, but we do recommended cleaning your deck at least twice a year to remove pollen, organic debris, dirt or stains. A broom or sweeper works better than a hose and is a much greener cleaning method. If you find accumulated dirt or grime, use soap and water and a scrub brush and simply rinse off with water. When cleaning deck tiles, ensure the surface the tiles are installed upon has proper drainage. Additional information can be found on our Care & Maintenance page. Q. How do I build a deck? A. Every deck will have its own unique requirements. In order to make your project a success, please follow the official Cali Bamboo decking installation guide. Q. Can I power wash Cali Bamboo decking? A. It is recommended that only professionals use a pressure washer with wide fan tips, at low pressures. If done improperly, extreme concentrated high pressure will damage any composite deck material. Exercise caution and check with a professional as improper use could lead to damage or loss of your warranty coverage. Q. Will heat from grills or fire pits harm Cali Bamboo decking? A. Not usually, but dripping grease can cause stains, so it is recommended a mat is placed under your grill. Improperly installed fire features and fire pits can cause damage from direct exposure to flames or excessive radiated heat. Exercise proper caution when designing, installing and using fire features. Q. How much ventilation is required under a deck? A. Make sure there is adequate and unobstructed airflow under the deck to prevent excessive water absorption. Improve drainage or grade flat areas where standing water may gather. For decks with limited ventilation, six inches of clear ventilation is required. 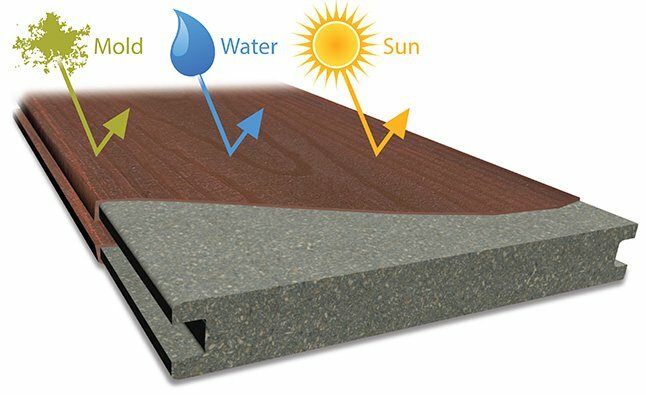 Regarding composite Deck Tiles — which are installed directly onto an existing flat surface — ensure the surface has proper drainage. Q. Can I put Cali Bamboo decking directly on a concrete patio? A. All decking products should ideally maintain a minimum of 6″ (15 cm) between the bottom of the deck substructure/joists and the ground. The deck design must allow unrestricted airflow under at least half of its perimeter to permit adequate ventilation. However, Deck Tiles are perfect for installations directly on top of concrete or asphalt, and are great for smaller spaces. Q. Where can Deck Tiles be installed? A. Deck Tiles can be arranged and snapped into place directly on top of an existing patio, balcony, courtyard, or deck. The existing hard surface must be stable, smooth, and even with no more than a 2% grade. Tiles are not recommended over dirt, grass, or other organic material. Q. Can deck tiles be installed in different patterns? A. Yes! 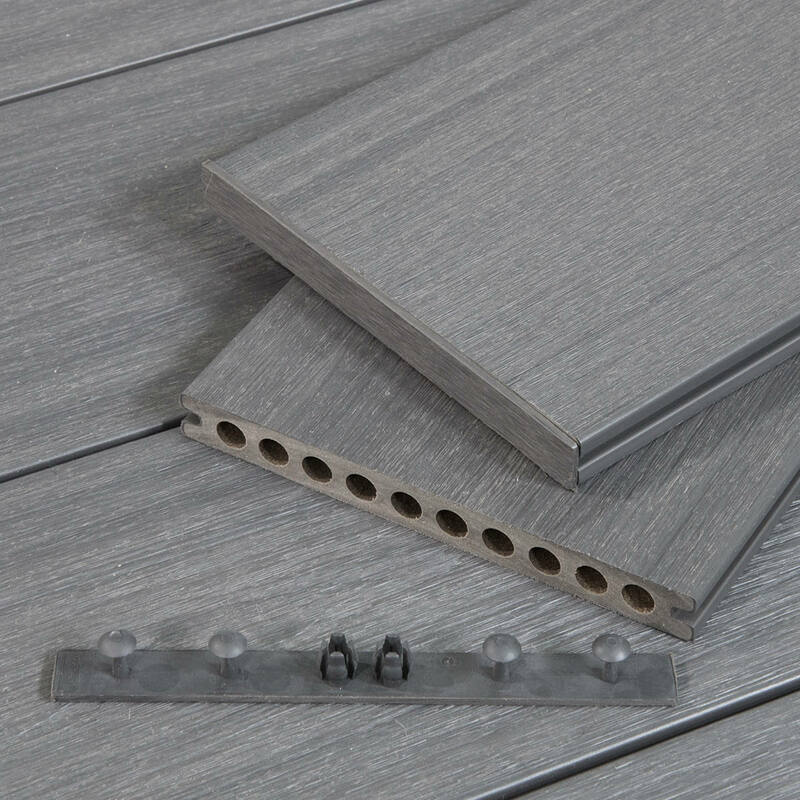 Each tile has a locking edge on all four sides allowing it to snap together with other tiles in a cross-hatch pattern, straight, linear installations, or in whatever design your creativity allows. The individual tiles themselves should be kept intact; pulling off and repatterning individual planks is not recommended. Get the look of genuine lumber with an eco-minded, low-maintenance alternative. TruOrganics® Wood Grain features a beautiful texture with distinct rays and knots. Installing your deck is a breeze with our hidden fastener system! These fasteners are incredibly secure, great for creating a pristine looking surface, and you’ll never have to worry about catching your toe on a protruding nail (ouch!). Our TruOrganics® composite decking is encased in a ultra-durable full protective wrap shield, which offers protection against stains, scratches, snow, and sun damage. We know picking a deck for your home can be a tough decision, so we're here to help! Call us to chat about your project, get expert advice, and learn about pricing. Stronger, lighter and built to last. Get samples, and feel the Cali Bamboo difference!. 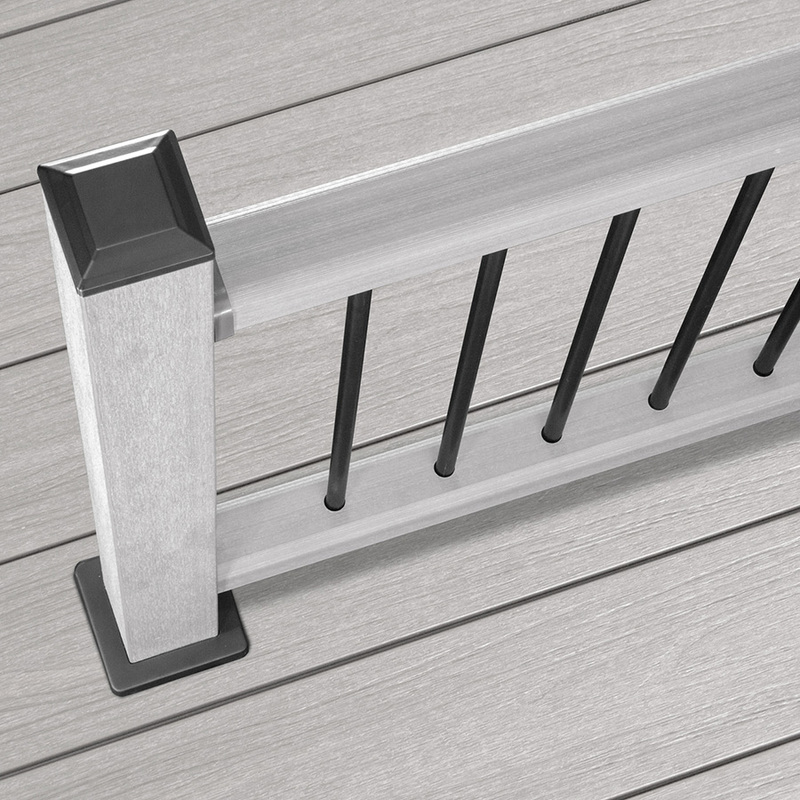 Our decking is created with CoreMax™ Technology, engineering cylindrical chambers that run the length of each board. Much like the physics property that makes a tube less flexible than a rod, the hollow CoreMax™ Technology increases tensile strength by 35% while reducing overall weight by 20%. All of Cali Bamboo's composite decks are made from 100% recycled materials for reduced environmental impact. Composite decking is significantly low-maintenance, in contrast to traditional wood decking. No painting, sealing, or sanding required! Not all composites are created equal: Our premium ingredients and manufacturing processes form the foundation for a wear-resistant product with powerful durability.